Portable Voice Recorder with Noise cancelling. Shock absorption surface and it only weights 1.1 oz. Smart but Big Music. Go into settings, play mode, and then Shuffle. Automatically scan and save your FM channels. Audio format under bluetooth mode: Only supports MP3 / WMA / WAV / APE formats. Audio format:MP3 WMA APE FLAC WAV AAC-LC ACELP etc. 【 Wireless Bluetooth 4.0 】 This MP3 Player compatible with Bluetooth version 2.0-4.1, you can easily and stable connect your Bluetooth sports headset and Bluetooth speaker. Lossless music playing. Provide great quality sound for the array of music and convenient to download (Support MP3, APE, and FLAC WMA etc.) And you can add bookmark for your music files (including audio book it supports). PRELOADED UNBRANDED MP3 PLAYER CLASSIC ROCK AND ROLL . Has 16gb micro sd card with 1500 classic Rock and Roll songs with groups from ACDC to ZZ Top. Comes with earbuds and usb charging cord. Free shipping in the USA. Full songs in mp3 format. Promotional use only. No rights reserved to music or artist. Pre recorded playlist. Buy with confidence. PLEASE LOOK AT MY OTHER LISTINGS OF GREAT PRODUCTS. Audio format:MP3 WMA APE FLAC WAV AAC-LC ACELP etc. Audio format under bluetooth mode: Only supports MP3 / WMA / WAV / APE formats. Allows you enjoying music more than 5000. Video : support AMV AVI format ( Need to convert through the conversion tool 320 280 size format). • Equalizer settings: Natural, Rock, Pop, Classic, Soft, Jazz and DBBBuilt-in FM Radio. • 8 Equalizer Settings: Jazz, Classic, Pop, Rock, Natural, 3D,Bass and Custom. • Video Support: AMV format, provided software to convert video to AMV movie format. MicroSD card slot. 8GB flash storage w/standard USB connector. 8GB USB 2.0 Flash Drive MP3 Digital Music Player. Built-in FM radio. Built in MP3 Player. Compatitable audio format: MP3, WMA, WAV. Audio output: 3.5mm earphone Jack. 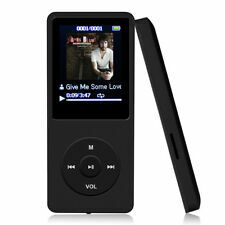 8GB MP3 Music Player is your good music helper. With its small size and fashion design, you can take it anywhere. 360 degree swivel clip design is convenient to take in different occasions like swimming, gym, running, driving and winter sports. • Video Support: AMV format, provided software to convert video to AMV movie format. • 8 Equalizer Settings: Jazz, Classic, Pop, Rock, Natural, 3D,Bass and Custom. • Digital recording: records with the integrated microphone. NEW BLACK 32GB MP3 4TH GENERATION MUSIC MEDIA PLAYER WITH MUSIC VIDEO PHOTO... 1.8” Screen with built in rechargeable battery & internal memory • 32GB built in memory hold up to 4000 song • Supports the following audio formats: MP3, WMA, ASF. Supports video format:AMV ( Does not support Itunes) •Small and light design makes it convenient to carry and use • The camera lens can cause the colour settings to be affected by light and the LCD therefore the theme colour and picture may differ slightly BE THE BEST BUY THE BESTItem Description 1.8" Screen TFT 65K colour display. .
LOSSLESS AUDIO: Excellent sound quality, supports MP3, WMA, FLAC, APE, AAC, OGG and ACELP. 1xMP3 / MP4 Player. Video support: AVI (Need conversion tool to convert, resolution 128 160.). Supports playback of MP3 and video in AVI format. Search Term:MP4 MP3 Player, FM Radio, Voice Recording, Photo Viewer, E-book Reader, Media Player, 32GB Memory Capacity, Features:It support multi language such as,English, Italian, French, Simple Chinese and more.1.8inch large HD real color lcd screen.Large capacity,support 32GB memory capacity.Built-in FM Radio (Tuner 87MHz - 108MHz) with channel storage function, 20 Stations saved.It can be a FM radio voice recording photo viewer,E-book reader media player. Description:High working rate,it works steadily and consistently and it is not easy to break.It supports WMV, MPG, MPEG I , MEG II, and AVI Convert To AMV.It supports multiple music formats: MP3, MP4, WMA, WMV, ASF, WAV, DMA.You can enjoy the song and movie anywhe. Description 1.8" TFT LCD screen Audio connector: 2.5mm stereo headphone jack Build in (JPG, BMP) Picture browser Supports MP3, WMA, WAV format Video Support: AMV format, provided software to convert video to AMV movie format Repeat modes: Normal, Repeat One, Repeat All, Folder, Repeat Folder, Random and Intro Equalizer settings: Natural, Rock, Pop, Classic, Soft, Jazz and DBBBuilt-in FM Radio Digital recording: records with the integrated microphone Ultra-High Quality Stereo Sound Work as a Thumb Drive: File management: manage files with folders as on computers Built-in rechargeable lithium battery Built-in 32GB High Speed Flash Memory. 1 x MP5 Player. -Music: Support WMA, DRM, OGG, APE, FLAC, WAV, AAC formats. -Recorder: FM & MIC recording. -Video: Support AVI, WMV, FLV, RM, RMVB, MP4, 3GP, MPEG, VOB, DAT and SWF format. -Video rec and FM radio.